We had quite a deep freeze here in the Northeast recently. We had temps in the single digits for weeks at a time. Brrrr it was cold! During frigid temperatures (and throughout the year, if I’m being honest), I really love a delicious bowl of soup. 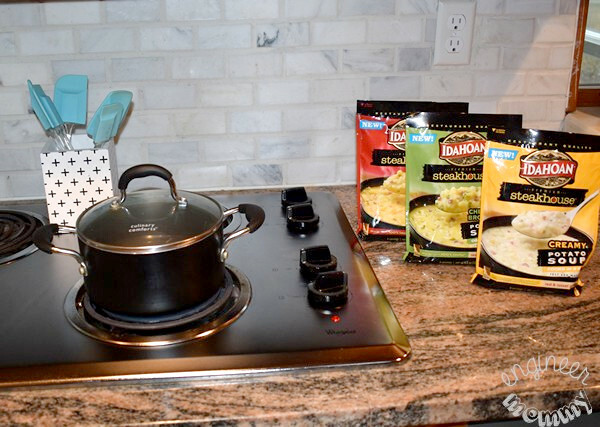 I recently tried Idahoan® Steakhouse® Soups and I love that they are a quick, delicious meal option for me during these cold winter months. To go with the soup, I made a vibrant, seasonal salad that features roasted pumpkin, sliced figs and candied walnuts. I love that the walnuts add a delicious crunch and boost in protein. To intensify their flavor & add some sweetness, I place a handful of nuts on the stove over medium heat with a tablespoon of sugar. Toss for a few minutes until the nuts become extra fragrant. Next I start by taking some cubed pumpkin and placing it in the oven at 375 degrees for 30-40 minutes. This caramelizes the pumpkin and makes the bite-sized portions absolutely delectable. While the pumpkin is roasting in the oven, it’s time to prepare the soup. 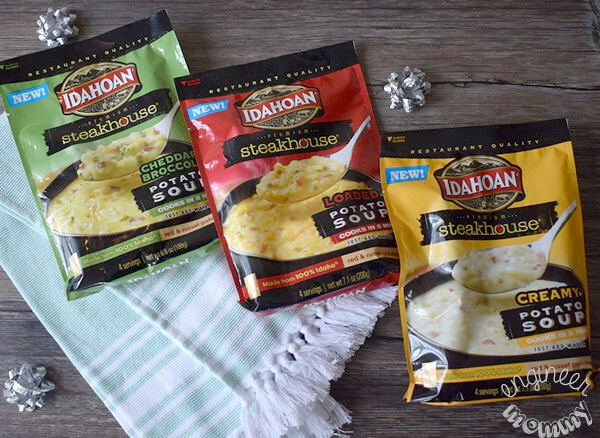 Today I am trying the Loaded Potato variety of Idahoan Steakhouse Soups but there are other flavors available: Creamy Potato, Cheddar Potato and Cheddar Broccoli. I cannot wait to check out the other flavors this week! 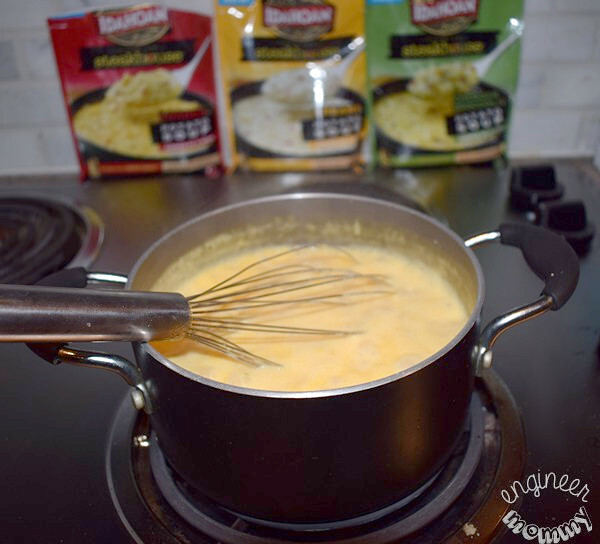 Start by boiling 4 cups of water in a medium pot on the stove. Did you know that January is National Soup Month? What is it about a big bowl of soup that makes it the perfect comfort food? 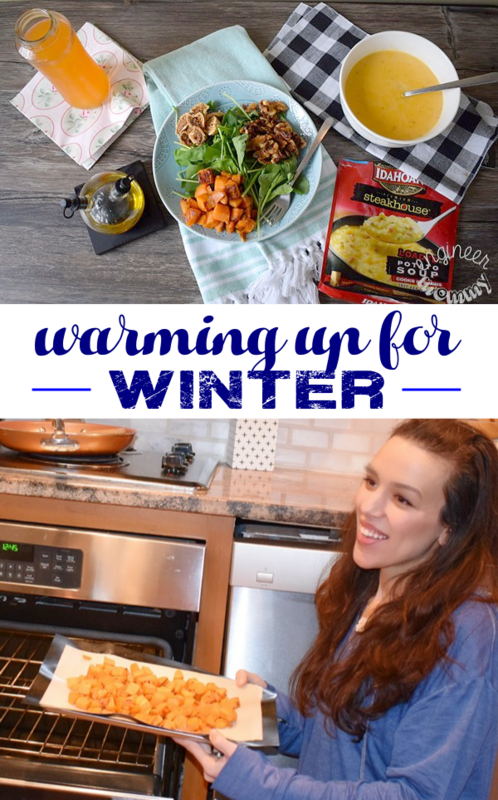 Prepare a big bowl of comfort for yourself this winter! 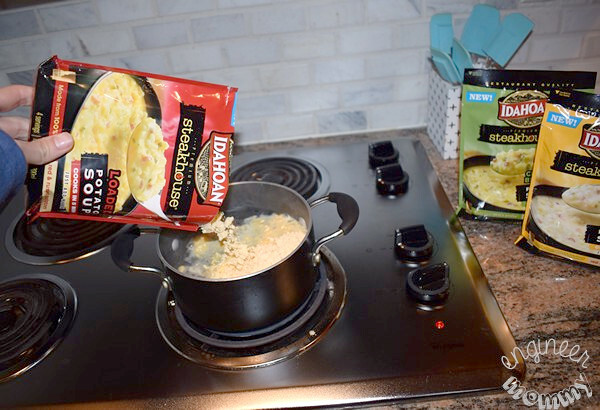 Once boiling, pour the contents of one packet of Idahoan Steakhouse Soup into the water. Whisk for 5 minutes. Then shut off the heat and let the sit for 5 minutes. This soup is delicious and warm and comforting. Everything you want from a bowl of soup during winter! This soup is good for the belly and good for the soul! 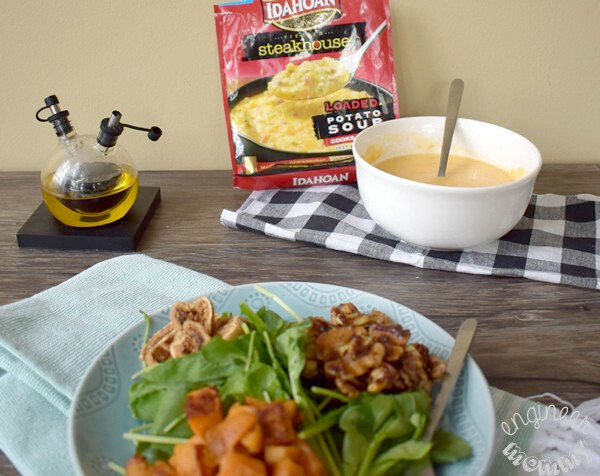 I love that Idahoan Steakhouse Soups provide a flavorful, slow-cooked taste of gourmet soup that can be prepared in only 5 minutes at home. To put the salad together, simply top a bed of arugula with the roasted pumpkin, toasted walnuts and some sliced figs. 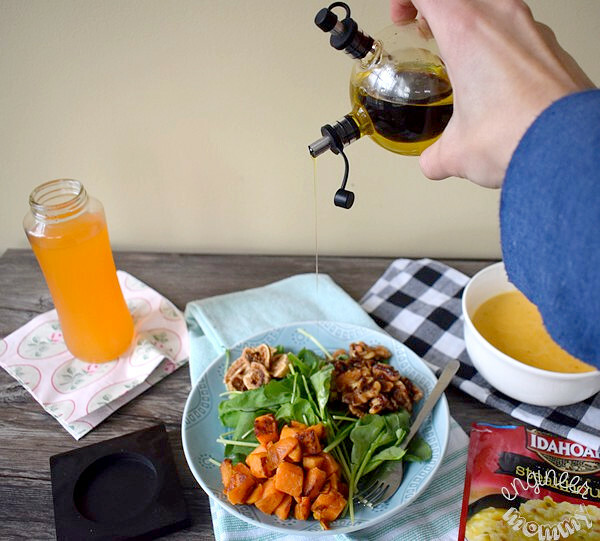 Drizzle some oil & vinegar on top of the salad. Season with salt & pepper, to taste. 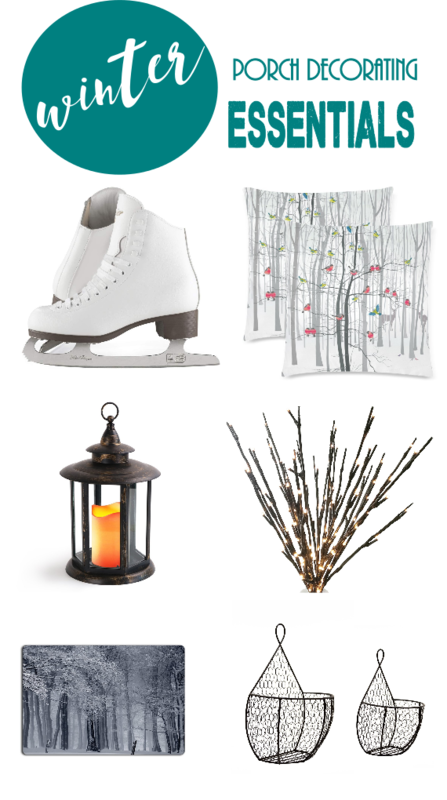 How are you going to stay warm this winter? 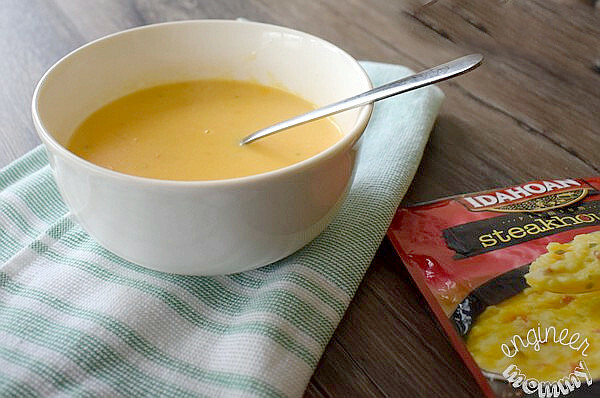 Be sure to make this soup yourself and experience the rich, creamy texture of Idahoan Steakhouse Soups for yourself this winter! 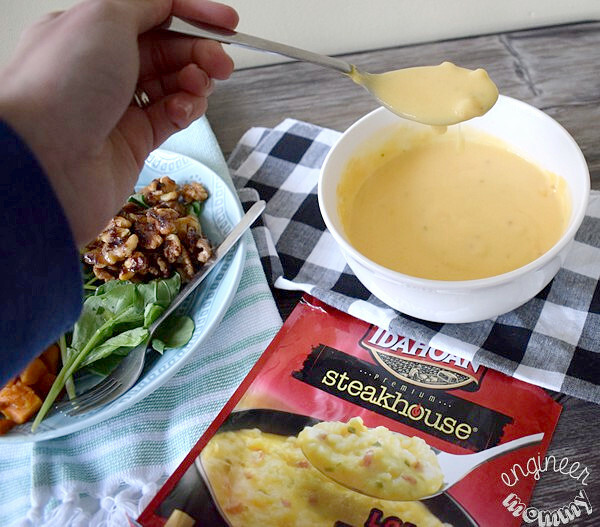 I love that Idahoan Steakhouse Soups combine red Idaho® potatoes with tasty seasonings and creamy cheeses. 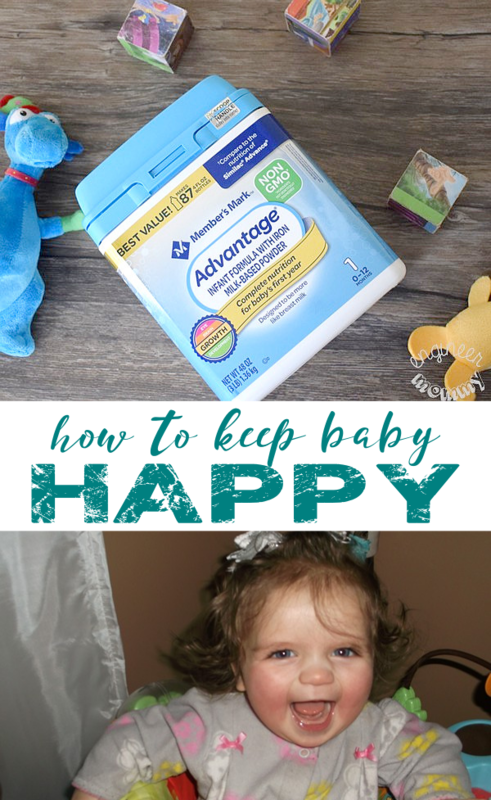 Every spoonful is delicious! Is there anything better than cuddling up indoors by the window with a big bowl of soup and watching the snow fall outside? I think that’s pretty much my idea of a great winter afternoon! 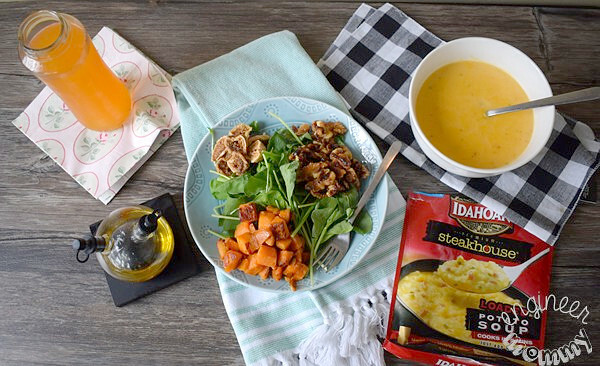 Look for Idahoan Steakhouse Soups at your local retailer and learn more about them by visiting their site here. To keep up with the latest news & offers from the company, check them out on Twitter, Facebook and Instagram. 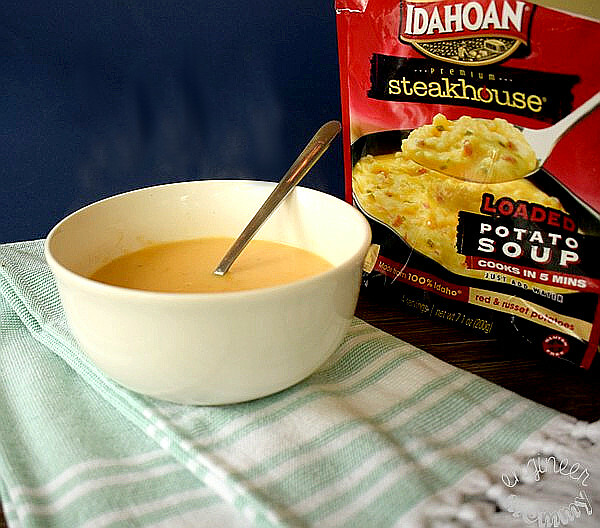 Experience the rich, creamy flavor of Idahoan Steakhouse Soups for yourself this winter. Have you ever made a salad with roasted pumpkin & figs? 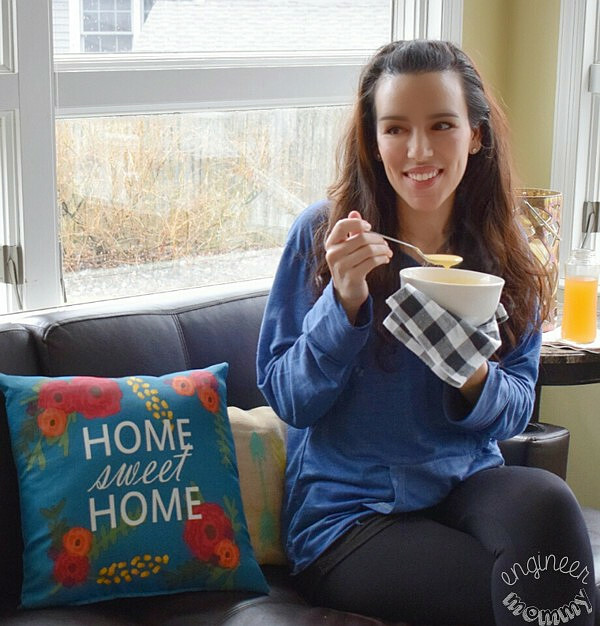 Do you love a comforting bowl of soup during the colder months? 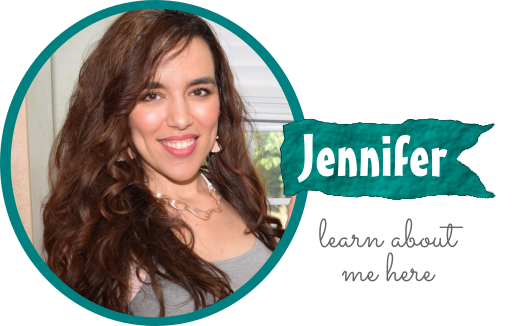 My husband eats soup almost every single day! I love it when it’s cold outside and I take that first sip of warm soup. Mmmm. Extremely cold here as well. Soup is something we have been eating tons of. These sounds delicious. It’s been freezing here in the south. We’ve had single digit temps too and I’m not used to it so I have to find ways to warm up. The soup looks amazing! I need to look for this soup at the grocery store. I’m in the Northeast and yes we sure did have some cold. I love to keep things like this on hand. We’ve tried the Potato so far. Yum, I would love this! I’m all about warming up–I hate being cold. I eat a lot of soup in the winter. This is my kind of warming up. The soup looks and sounds fabulous, there is nothing like good warm soup on a cold day. 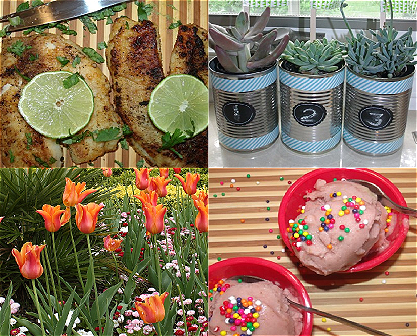 These soups would be a great lunch option for me! 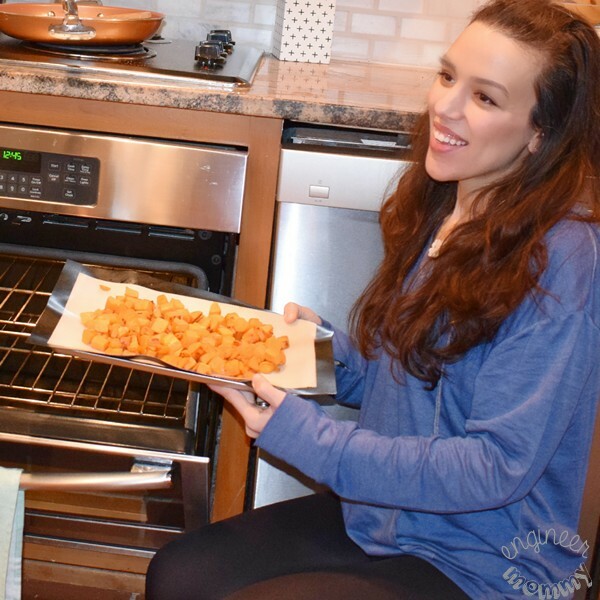 It is just me at home during the day and sometimes I neglect a lunch option for me, but these seem simple enough to warm up and look delicious! Nothing like a big bowl of piping hot soup to warm us up during the winter. Haven’t seen these soups in my local stores but they look really hearty. Although we usually have big bowls of soup during the winter, the rest of the year is all about soup and salad. The South has been cold too and here in Chattanooga we might see snow tomorrow – but would rather not. Always looking for ways to stay warm and food is usually part of it. It can get so harsh with the temperatures that I am up for ANY recipe that’ll keep me warm. Your recipe seems absolutely delicious! This is the kind of food we’ve been eating lately. Even in the south it’s been frigid! I love soup in the winter. It’s just so warming and comforting to eat in the cold weather. This salad looks and sounds so tasty and healthy. Both pumpkin and walnuts are a personal favouite. Love to eat roasted almonds. We have had the weirdest winter here. Normally we are shoveling feet of snow and right now we are wearing short sleeves. Crazy, I need my soup weather! I can’t say I’ve tried potato soup before, but it sure does sound like the perfect treat for the winter season. 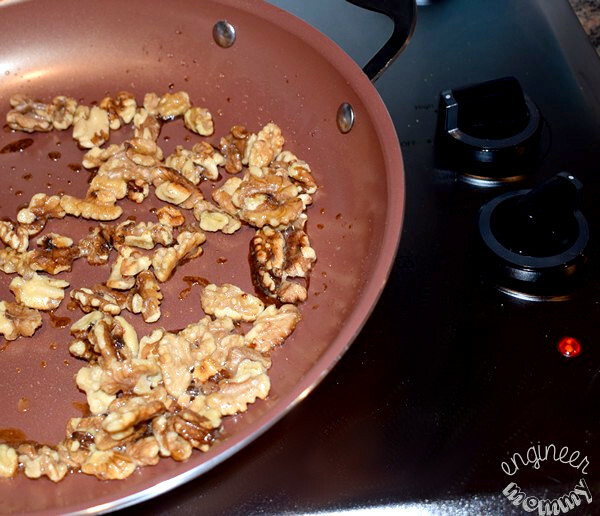 I made some toasted walnuts the other day. They were super tasty. The soup looks so warm and I wish I had some in front of me right now. YES to toasted walnuts!! I love hearty soups and sandwiches this time of the year, any comfort food really!! Ohh I didn’t know that January is National Soup Month. Well, i guess its not too late to participate. I will also try this recipe and see if I can make it successfully.